Zion National Park Views, "Virgin Villa"
Gezellig privé vrijstaand huis met uitzicht. Rustig landelijk gebied in de buurt van de Virgin River. -PLAATSELIJK VRIJSTAAND HUIS op grote hoekperceel in Virgin, Utah. -NIEUW: DIRECTE TV! Geweldige wifi. - We zijn op de MESA; VEEL DICHTER naar ZION NATIONAL PARK dan de accommodaties in Hurricane of LaVerkin. -Prachtige UITZICHTEN van ZION National Park. -Romantische instelling; de bevolking van de Maagd is <600 mensen. - Dit huis wordt alleen gebruikt als vakantiewoning. Niemand woont daar. - Wil je langer dan een paar dagen blijven? Vraag me over mijn lage tarieven voor meer dan 30 dagen. -BRAND NIEUW Comfy LEDER COUCHES in de Living Room. -OPZONDERLIJK GEEN ENKELE DIEREN TOEGESTAAN: GEEN UITZONDERINGEN. Allergie-patiënt. -Our vakantiehuis is recentelijk gerenoveerd met WiFi, nieuwe verf, tegel, vloeren, meubels, beddengoed, linnen, lampen, kranen, badkuip en toestellen. -Engaporatieve koeling in de woonruimten. - KINDEREN & ZUIGELINGEN (leeftijden, alstublieft): MOET IN DE GASTELAMING WORDEN INBEGREPEN. -BADKAMER: betegelde bad / douche combinatie met een aparte wastafel en aanrecht. Nieuw flush toilet met drukknop in Europese stijl. -Privé PARKEREN voor meerdere auto's. -FULL KEUKEN met alles wat nodig is om te koken en maaltijden te serveren (zelfs een rijstkoker). -WONINGRUIMTE heeft een wasmachine, een droger en een strijkplank met strijkijzer. -BBQ grill, picknicktafel, hangmat, en andere openlucht meubels. -BESTEMMINGEN op voorwaarde dat: melk, brood, sinaasappelsap, margarine, eieren, ontbijtgranen. -Town van SPRINGDALE is de stad net voor de ingang van Zion NP. Het heeft vele restaurants, cadeauwinkels, een supermarkt en 2 benzinestations. Er is een andere markt, een grootwinkelbedrijf en nog 2 benzinestations op slechts 6 mijl langs de mesa in LaVerkin. -KOLOB TERRACE ROAD bevindt zich in Virgin en op 30-60 minuten rijden kun je wandelen, vissen en kamperen. We certainly enjoyed our stay at Virgin Villa - I was participating in the Zion 100 Ultra Marathon. This was the perfect location and the house had all that we needed - it is older but very well maintained and equipped. The lovely touches of having the breakfast items stocked in the fridge was greatly appreciated. Rosemary was in touch with us about some windstorm damage the night before we arrived - but if she hadn't told us about it we never would have known, as the property was all neat and tidy when we arrived. It is in a quiet area, close to Springdale and La Verkin, and met all of our needs beautifully. Finally, the fresh homemade banana bread from Alicia on our final evening was just a reminder that this is a special place operated by special people. My father and I stayed here while we were visiting Zion. The villa was lovely, the included amenities were great, and we had a really good time. The hostess was extremely pleasant and on the ball! The house was very clean, and everything you could need. Right down to a chip clip! Having a decent start for breakfast and a beer at the end of the day is a fantastic touch! Excellent overall! Armand, thank you for taking the time to write your review to let others know about your experience. 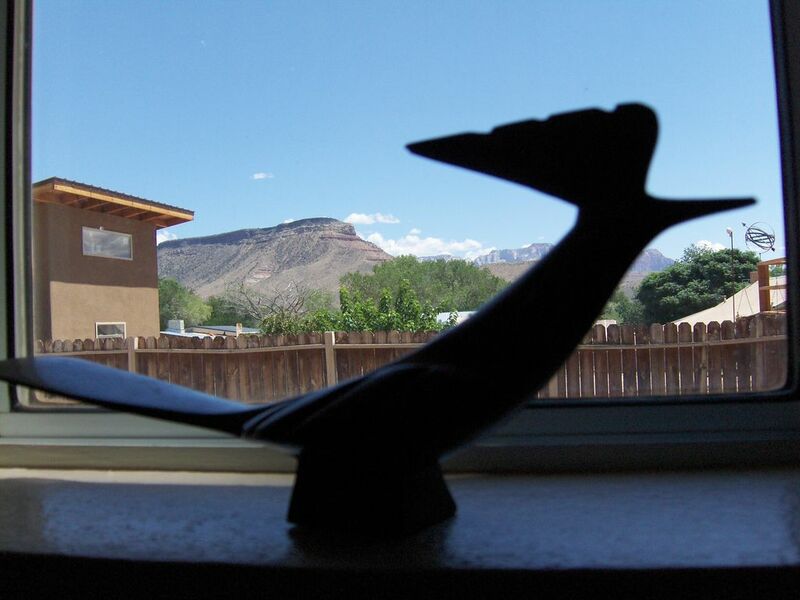 I am always pleased when I hear that a guest has been very happy with their decision to book my Zion Views Virgin Villa! Presenting guests with a clean comfortable environment and anticipating their needs during their stay at my vacation house are essential to guests' enjoyment of their visit to our area. And perhaps even a return visit. Wonderful, clean, comfortable home, close to Zion w/personable, friendly hosts! Had a great time at the Virgin Villa w/everything we needed in an awesome location! Close enough to Zion but not in the middle of the sometimes busy tourist chaos. Hosts Rosemary and Alicia are the sweetest and truly care about their guests' comfort and happiness here, as a homemade treat that welcomed us outside our door one morning will attest! I hesitate to tell everyone about it, only to keep it to ourselves so's it will be available should we come back, lol. No, we will tell all our friends about the Virgin Villa and about amazing Zion Ntl. Park. We highly recommend both!! TY Rosemary and Alicia for making our first VRBO experience a positive one, on ALL accounts. I appreciate your detailed review of your stay at our family's Virgin Villa. Future Guests will certainly benefit from the information you have kindly provided. Alicia and I do enjoy hosting Guests very much and we hope that their choice to stay at our vacation house adds to their enjoyment of their stay on the beautiful Zion National Park mesa. Thank you for your recommendation and we look forward to hosting you and yours again very soon! Very clean and Rosemary makes you feel right at home. It was wonderful not having to get groceries right away. She starts your stay out with everything you need for breakfast. The cold beer was a nice touch after a day on the road. Would stay again. Roxanne, thank you very much for taking the time to write a review. I am so glad that you enjoyed your stay and my daughter and I am looking forward to a future booking from you! My husband and I rented Rosemary's place for a month. The house was a bargain, and it's just about 15 minutes from the park, so it was perfect for us. While it's not luxury accommodations, who needs that? We wanted a comfortable place to live for a month while we hiked every day. We wanted a place to cook food, a place to sleep that was cool, and a place to unwind. We got all that and more. The owner's daughter is a gem! She lives next door and brought us homemade goodies, showed us the best swimming holes, recommended a few hikes, and even led us 30 minutes up a mountain to a secret cave hike, despite getting ready to go on vacation herself. Although I'm giving the place five stars, there was one important thing I'd change: the seating in the living room. We let them know already, and they were amenable to fixing that issue. One final thing: I think Rosemary could charge an extra $10/night just for the convenience of having cable TV, though it was super easy for us to hook up our laptop to the HDMI cable and stream Netflix, Hulu, and even cable on their good-size TV, so it's not even necessary. But if you don't have a laptop, bring an HDMI converter for your phone (it's about $45, and they sell these at Walmart). I would definitely come back for the price and the convenience. It was probably one of the top three vacations of my life—and I've been to Zion seven times! Thanks, Rosemary and Alicia, for the great place and the hospitality. Thank you Leslie for your thoughtful positive review. I am always happy to hear that my Guests enjoyed their stay at my vacation house. We took your suggestion about the seating in the living room and 2 brand new red leather sofas were delivered and set up in the living room 1 week after your check-out. And they are very comfortable! Please see my updated photos on my listing. I am looking into Cable TV options now that, on 7/25/18, my right to resume Short Term rentals of 3+ Nights was reinstated by the Virgin Town Council via a unanimous vote. It became effective immediately. I am looking forward to meeting many more new Guests, and perhaps some who had booked my place in the past. Leslie, Alicia and I look forward to welcoming you back for another stay! Het gebied is landelijk Utah, en ligt op slechts 13 mijl van het Nationaal Park Zion. Het is erg stil en er rijden weinig auto's. Het huis is gelegen op een hoek veel en er zijn paard en schapen weiden over de weg. De Virgin River is een 3 blok lopen van het huis. De oprit en de parkeerplaats zijn geschikt voor maximaal 10 auto's, met ruimte voor nog meer langs de straat. Bryce Canyon, Lake Powell, Nationaal Monument Grand Staircase en de North Rim van de Grand Canyon zijn allemaal minder dan 2 uur rijden van het huis verwijderd. De rijtijd naar St. George is 30 minuten, naar Las Vegas is 3 uur, en het duurt 5 uur om Salt Lake City te bereiken.